Are you ready to blow everybody’s mind at Thanksgiving this year? This insanely easy, but super posh side dish is the perfect way to say “Yeah, I own side dishes.” No more marshmallow sweet potatoes or canned cream of mushroom soup green beans. We’re stepping up Thanksgiving this year. These sweet potatoes are lesson numero uno. Baked sweet potatoes are one of my favorite props. They are filling, inexpensive, delicious, and can serve as the base for about a bazillion different flavors. This fancy mix of sweet dates, tangy gorgonzola, and crunchy walnuts is the perfect mix of flavor and texture to take them over the top. And while dates, walnuts, and gorgonzola may be pricier ingredients, they’re also super flavorful, so you really don’t need to use a lot to get maximum flavor. Gah! I’m getting hungry just talking about them. They’re so droooooly delicious! 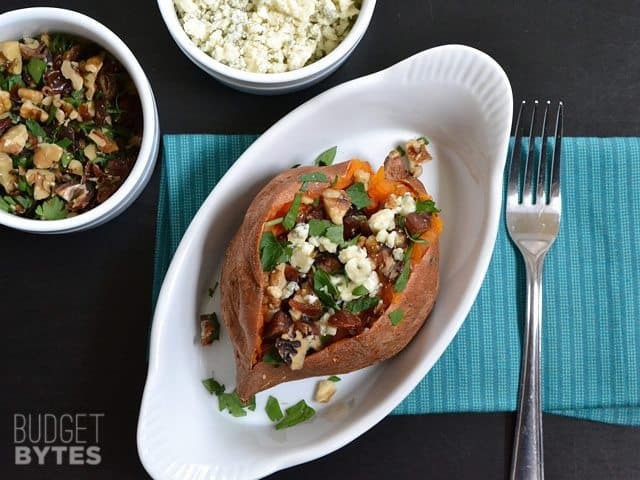 These Date & Gorgonzola Stuffed Sweet Potatoes are a simple way to make a big impression. These potatoes are dressed to impress. Preheat the oven to 400 degrees. 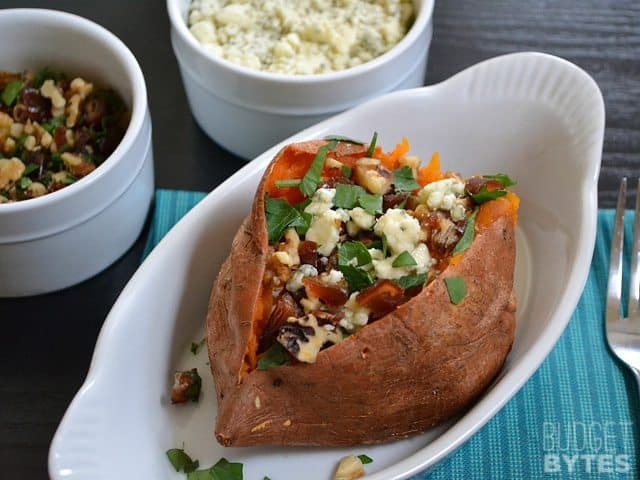 Wash the sweet potatoes and then dry the excess water from the skin with a paper towel or clean dish cloth. 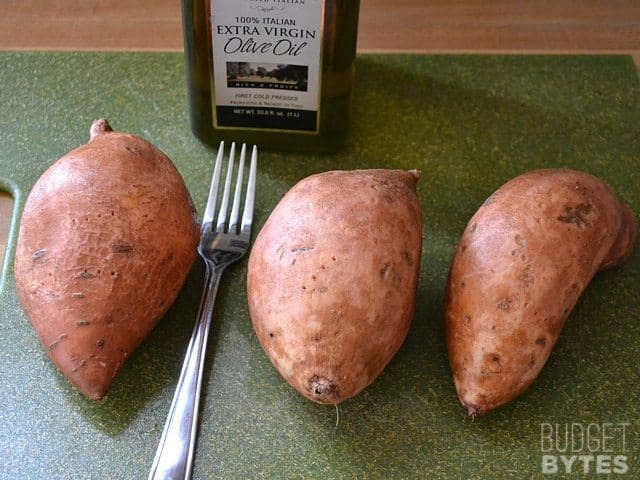 Rub the olive oil all over the surface of the sweet potatoes. Use a fork to prick each potato several times. Cover a baking sheet with foil and then place the potatoes on top. 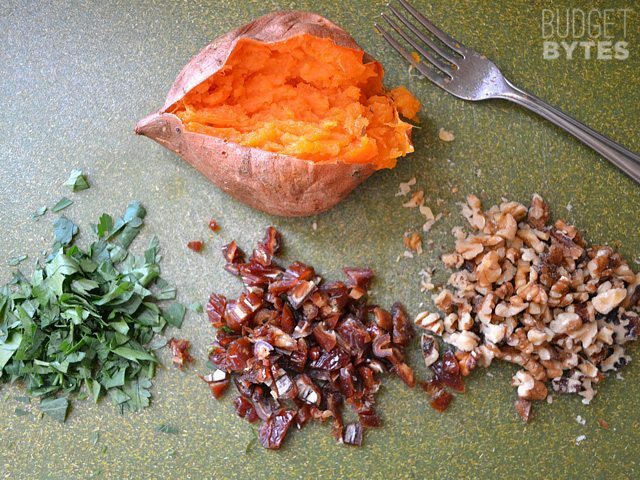 Bake the sweet potatoes for 45 minutes to one hour, or until they are soft all the way through (squeeze the potatoes to test for doneness). 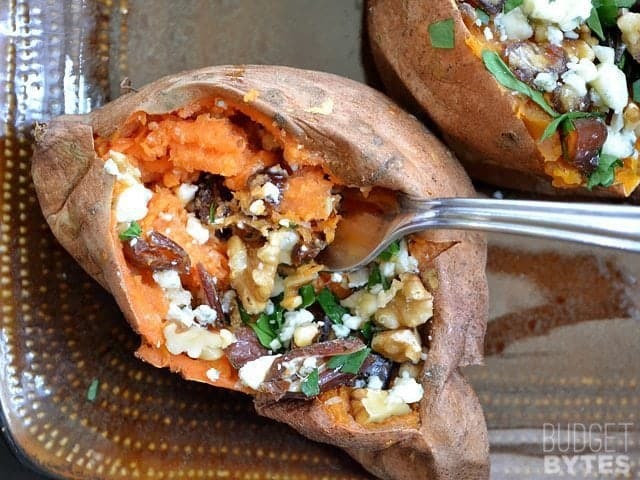 Allow the sweet potatoes to rest for a few minutes while you prepare the filling. Roughly chop the dates and parsley (and the walnuts, if not purchased pre-chopped). Mix the dates, walnuts, and parsley together. Once the sweet potatoes are cool enough to handle, slice them from one end to the other, lengthwise. Pinch each end and push in towards the center to make the potato pop open. Mash the inside up a bit with a fork, then stuff with the date/walnut filling. Sprinkle 1 tablespoon of gorgonzola on each potato. Serve warm. Wash and dry the potatoes, then rub olive oil over the skins. Prick each potato several times with a fork to allow steam to escape as they bake. 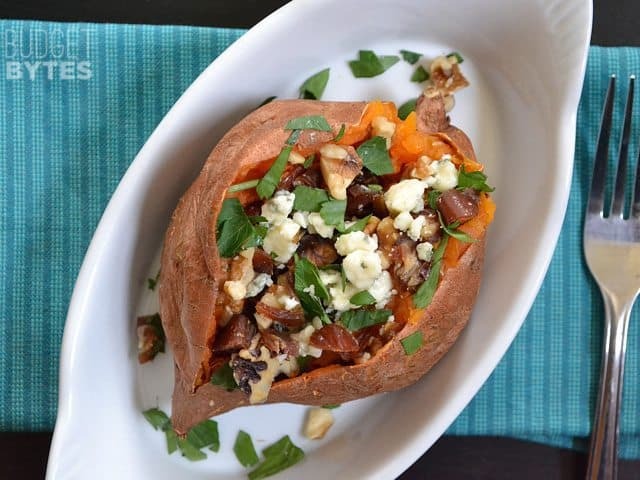 You’ll want to use small sweet potatoes so that each one will be one serving. Use potatoes that are slightly larger than your fist. My potatoes were about 3/4 lb. each. (I intended to only make three, but had more than enough filling for four potatoes, so I wrote the recipe for four, even though the pictures show three). Bake the potatoes in a preheated 400 degree oven for 45 minutes to one hour, or until they’re soft all the way through. You’ll want to bake them on a baking sheet, preferably covered with foil, because sugary juice likes to ooze out as they bake. That stuff will stick to the bottom of your oven and burrrnnnn. 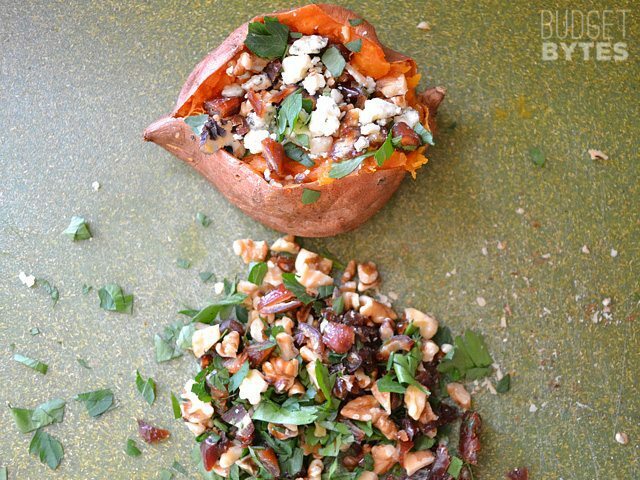 The bulk bins at your grocery store will be your best friend for this recipe. I literally bought six dates, expecting to use two per potato. As it turns out, it was WAY more than I needed for three. I also used about 1/3 cup of walnuts and a handful of chopped parsley. If you’ve never seen a medjool date, look here. They’re sweet and delicious like candy. I decided it was much easier to just mix together the dates, walnuts and parsley and then top the potatoes, rather than sprinkling each one on individually. I added the gorgonzola by itself, though, because it’s squishy. Such a pretty side dish. Dressed to impress. And how do you eat it? Just mix it all together with your fork and then savor every bite. Wanyed to like it but unfortunately I liked everything separately but not together. Big plus was discovering gorganzola!!! Delicious. What a fantastic idea! I will be cooking some kale and throwing that in to see if it plays well with the flavors– just to add a green veggie. Yum! I found some goat cheese and craisins on sale and immediately thought of subbing them into this recipe. Can’t wait to try it tonight! These look so yummy. My fiance loves blue cheese so this will be right up his alley! @Katie. I always cook sweet potatoes in the microwave because I’m lazy and impatient. Cook two at a time for about 6 minutes, then check and see if they’re done. It’ll be a lot of rolling around potatoes and pushing buttons, but it’ll save room in the oven. Also, thinking about it… you could precook the potatoes a day before and just heat them up in the microwave for less time. Sarah! Brilliant! Thank you for the advice! Maybe if I precook them I just won’t cut them open until after they’ve been reheated in the microwave! Thanks!!! I want to make these at Thanksgiving and with only 1 oven am trying to get creative. 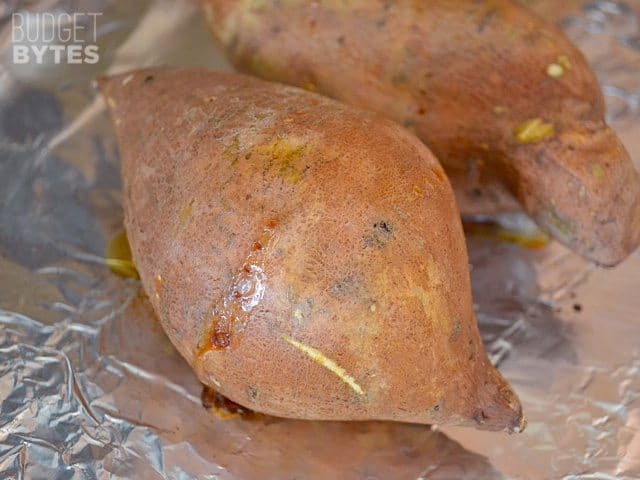 Could you cook the sweet potatoes in the microwave?? If so, how long? I’m thinking of putting 4 in there at once. I do not know if that will work! I do have a pretty big and new microwave so it’s pretty powerful. I would only do one at a time in the microwave, but yes, they can definitely be cooked in the microwave! You can see the instructions in this recipe. I’m going to be switching the dates for prunes, i think… Definitely worthy of being a weekday dinner main dish! God help me, but you could add some crumbled bacon and skip the turkey altogether. Bravo! I have several packages of feta on hand. Would that be a good substitute for the gorgonzola? It would probably work, but not quite as well as the gorgonzola. Thanksgiving, here I come! Looks better than candied yams that’s considered the “usual”. I’ll use chopped roasted pecans instead of walnuts. When I first saw this I thought, ‘gross!’. But then I started thinking about it, I love all of those ingredients and I love sweet/salty stuff together so I bet these are delicious! I’m headed to the store now, I’ll report in after I try them. And I will be trying these today! Tried it, loved it! I forgot the parsley and the nuts. But the dates, gorgonzola and sweet tater were delicious! I baked three potatoes so I get to have another one (or two!) tomorrow and I’ll add the nuts and parsley! Thanks for another delicious recipe! agree with marina–this looks delicious, and super filling as a veggie meal. for thanksgiving, i think it would be more sweet potato than most folks want to commit to on that over-filled plate. how would you portion these out for, say, a half potato per serving? oh, well, duh, just cut them in half, put on half the stuffing, i guess i can figure this out myself! 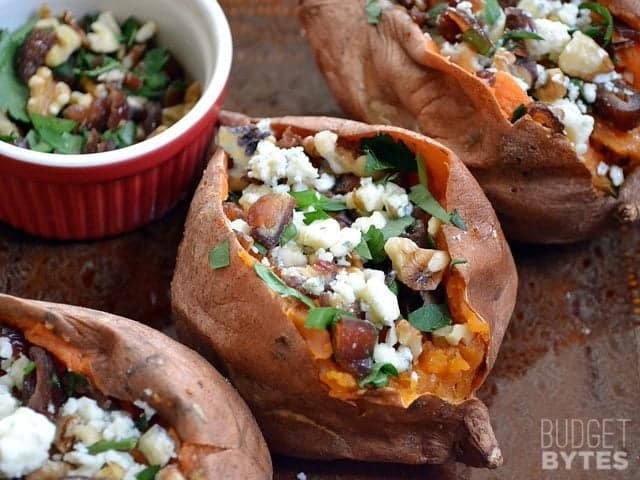 big thanks for addressing the big meal with some budget-friendly, super tasty dishes! this would be an awesome meatless meal just by itself! looks so yummy! I was just talking about how I need to find a food blog that still looks good but is cheap. Love this, looks super good and I’m trying it very soon! OMGGGGGGG This looks soooooo amazing!!! Pinning!